Field recordists need to stomp out dozens of problems in the wild: buzzing fridges, off-stage chatter, gear quirks, and much more. 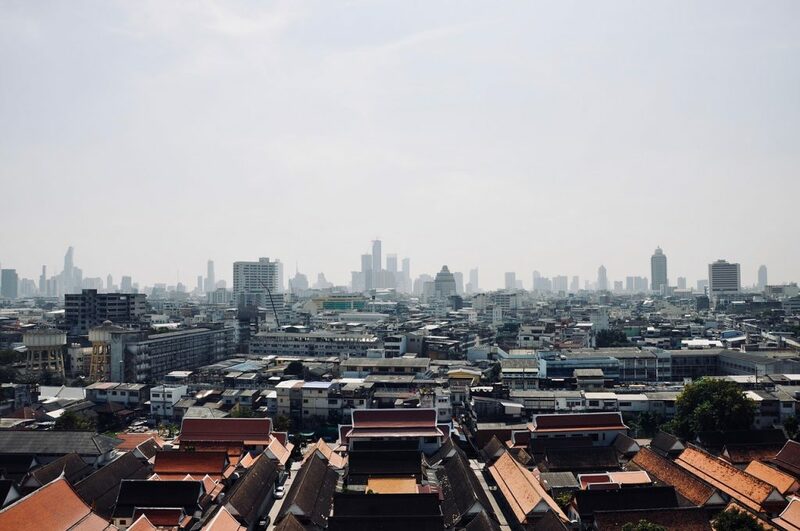 For those gathering sounds worldwide, there are other challenges, too. Asking directions to a state park to record birdsong isn’t easy if you don’t share a common language. I’ve picked up some language as I’ve travelled recording sound effects. 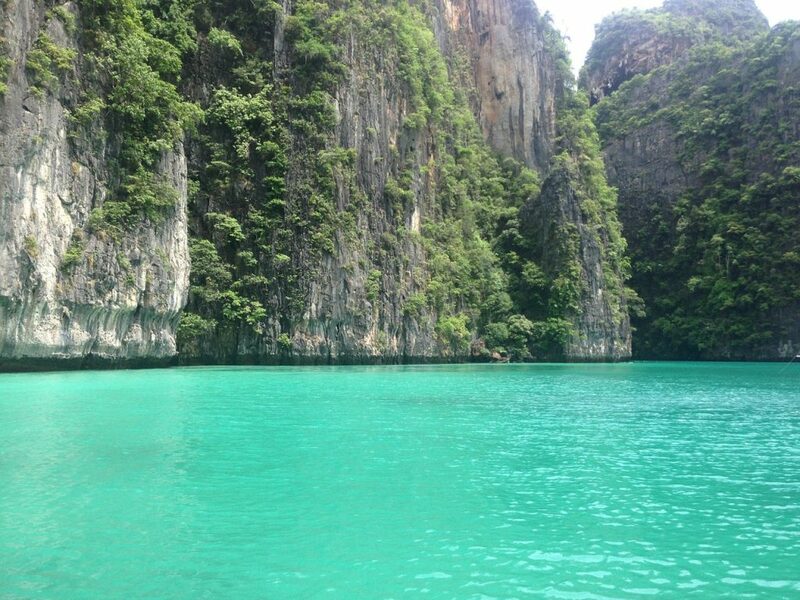 In Thailand, though, the language doesn’t use the Latin script. I can guess roughly what things are, but it’s common to order chicken and get pork instead, or take an off-ramp to the wrong place. Last week I was amazed when I learned that Google Translate can take a photo of a Thai menu and translate it to English. That wasn’t possible a year ago. So, it’s easier than before. It made me think about the concept of exchanging information more broadly, though. Often getting things done is held up by the need to translate one thing into another. The desire is there. The tools seldom are. Field recordists have this problem, too. Their inspiring field recordings won’t reach many ears if they aren’t presented properly. 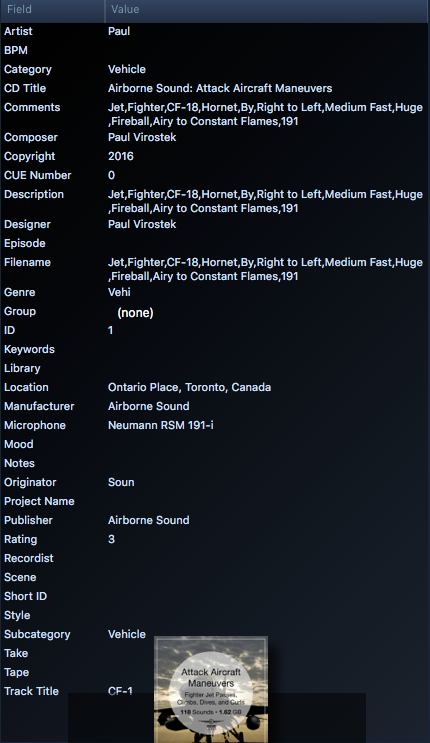 This is why metadata plays a vital role when sharing sound effects. It’s counter-intuitive. How widely their creations spread doesn’t really depend on the audio. It doesn’t matter if the sound is pristine or muddy. A sound that isn’t described properly can’t be found, won’t be understood, and will not be heard. It makes sense. How widely any idea spreads depends on how easily it can be accessed. Today’s post is here to help. It takes sound designers and field recordists a step closer to ensuring their sound can be found – and heard – by their fans. How? With a step-by-step guide for trading this valuable text information between two popular metadata apps: BaseHead and Soundminer. What is metadata? Why is it so important? Metadata is hidden text information that describes a sound. It’s baked into the sound itself, and doesn’t interfere with the audio at all. 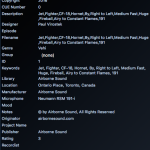 So, sounds with metadata can be heard normally. However, viewing these sounds in a specialized app reveals a waterfall of text fields filled with helpful information. Let’s think about an example: a car sound. Metadata expands on a roaring engine you hear with valuable text description: its model, make, who recorded it and when – details impossible to know from listening alone. This helps find the sound and select it amongst other similar ones. 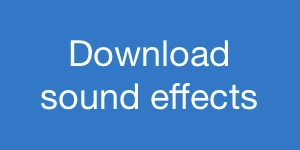 Read more about sound effect metadata. More field recordists have been adding this rich text to the sounds they share. They’re is a problem, though. 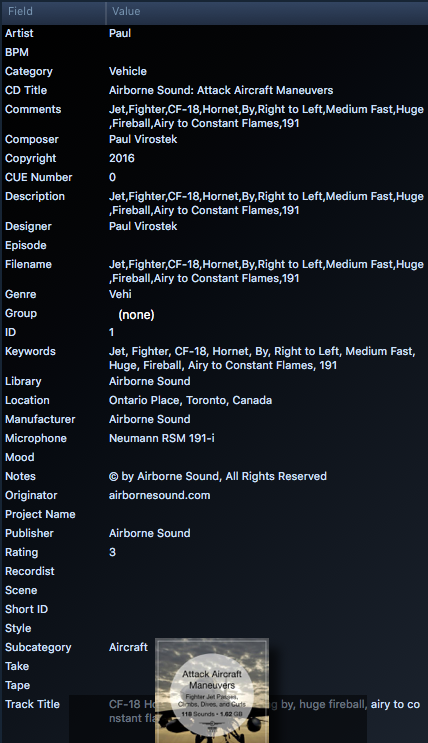 There are many sound fx metadata apps. They all compose metadata differently. Some use a proprietary format that cannot be accessed by others. 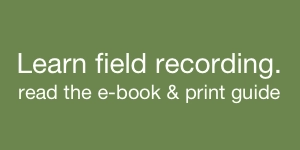 Others use only some fields (recorder, microphone, genre), have mismatched field names, or ignore others completely. The result? 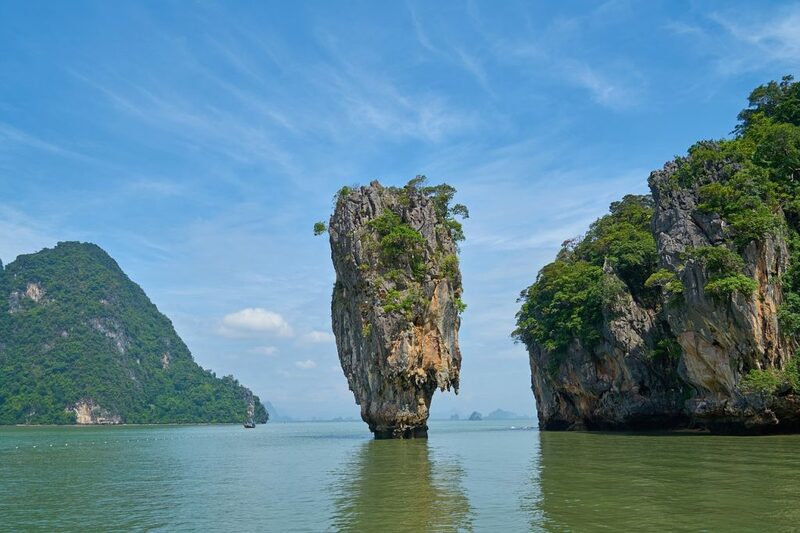 The same problem as the Thai script – sometimes you don’t get what you expect or end up in the wrong place. Any form of translation risks corrupting the source message before it reaches its destination. It introduces an extra step that adds time. It’s a weak link between sharing information. For metadata, mismatches slow things down. Information becomes inaccurate. It takes time to pair things properly. Why not help listeners by removing translation completely? It’s a valuable idea. Making metadata interchangeable helps more people find sounds, select them, and hear them. Let’s see what we can do to get things done. 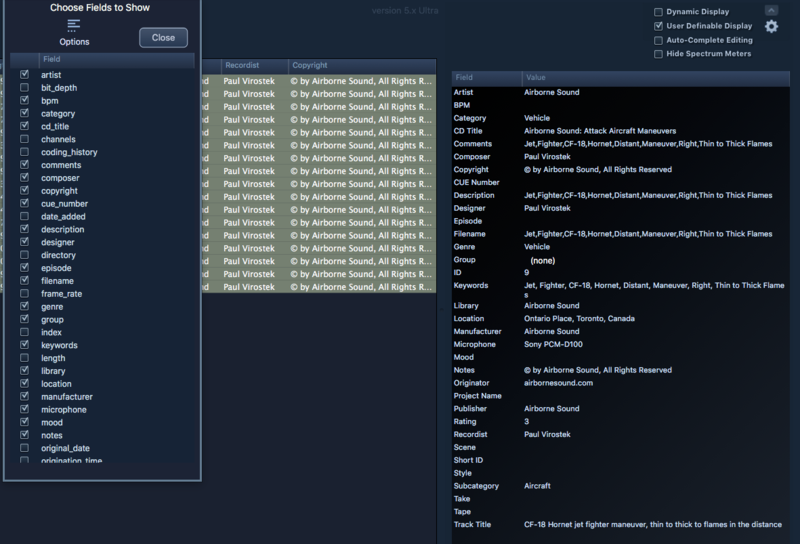 Both Soundminer and BaseHead embed metadata into the sound files themselves. They both read it from sound files dropped onto their app. The problem is that the information isn’t compatible. The text fields do not match. It’s not a perfect fit. Soundminer lacks a Copyright field. Track Title is spelled differently in each app. There are other examples. The result is that Soundminer may wipe some fields of metadata written in BaseHead. BaseHead may adopt only some of Soundminer’s fields. Either way, many hours spent writing metadata may be incomplete or lost. This is especially important if you don’t know which app your fans prefer. Should you customize your fields for BaseHead users? Is it better to take advantage Soundminer’s proprietary fields? Writing for one metadata app may abandon fans of the others. Why not use both? It’s possible with a bit of planning. This step-by-step guide helps ensure you have maximum compatibility between Soundminer and BaseHead. It shares how make Soundminer metadata usable in BaseHead, and how to adapt BaseHead metadata in Soundminer. You’ll need Soundminer v4.5pro and BaseHead 5 Standard or Ultra to unlock metadata writing and importing in both apps. Don’t forget to make backups before you begin! 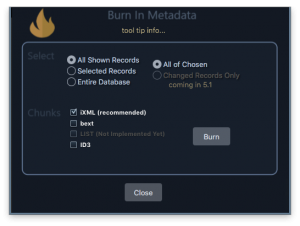 Soundminer burns many types of metadata. However, the most important type is their MetaWrapper metadata. This has interesting bonus fields that sound designers and field recordists value: data for recorders, microphones, design notes, and more. Unfortunately, this information is encrypted within the sounds. So, when you drag-and-drop these files into BaseHead, BaseHead can’t grab this information, and you won’t see it. Spent hours detailing every microphone you used in Soundminer? BaseHead will simply display an empty Microphone field. Here’s what it looks like when you drag Soundminer-embedded files into BaseHead. No need to worry, though. BaseHead’s latest version can import all Soundminer information with very little work. Let’s learn how. Note: BaseHead seems to have a few problems embedding 3-channel files on MacOS. The support team is fixing at the time of publishing and I’ll remove this notice when it’s fixed. Remember: always back up before you begin! Select the fields you want to display. 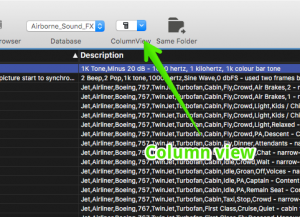 Click the ColumnView dropdown and check each field one by one. It is vital that you include FilePath. BaseHead will need this to find the files, later. 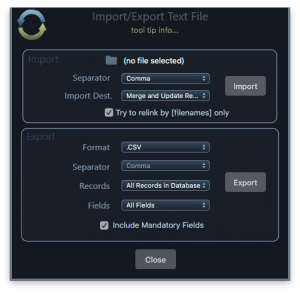 Find all the records you want to export. Select menu item Database/Dump Query to Text File. A file selection window will appear. Save the tab-delimited text file. Next, we’ll add this metadata to the same files in BaseHead. Click the Details button to view the panel. Click the gear image (upper right). Click the gear image next to it. A window will appear. Click the Options image. This will display a drop-down menu. Click Check All Editable Only. This will display all fields you can modify in the Details panel. Read more about this in an earlier post. 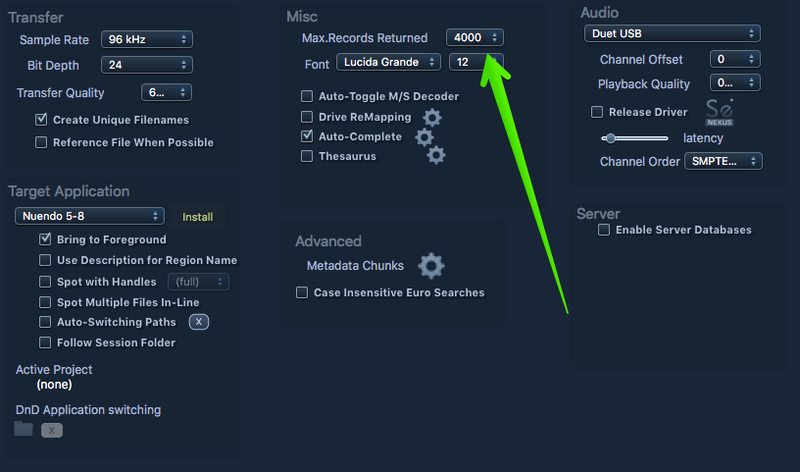 Select menu item BaseHead/Preferences and set Max.Records Returned to 4000 (or another high number). Why change? Libraries with a large amount of clips will show only the first 1000 clips by default. That can lead to mistakenly embedding only the displayed records, instead of everything. 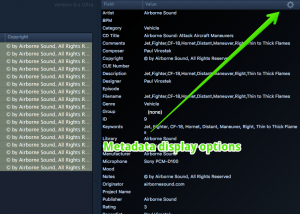 Select menu item View/Panel, Import/Export Text File or press F7. A new window will appear. Look at the top half of the panel. 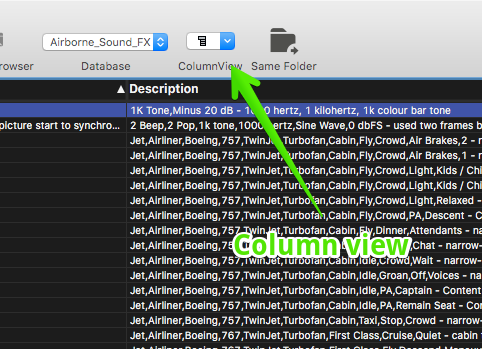 Click the folder icon to select the sound file from the step above. Separator: This tells BaseHead what character separates one field from the next. Not sure? No problem. BaseHead automatically detects the proper one when you add a file. Import Dest. : Choose New Import. You can also choose to Add to Existing Database to update existing files and find them by the file names. I had the most luck making a new import each time. Click the Import button. After a pop up warning, the files will be added to BaseHead. Artist: this seems to grab the first four letters from the Composer or Designer field. Add your personal or company name here. 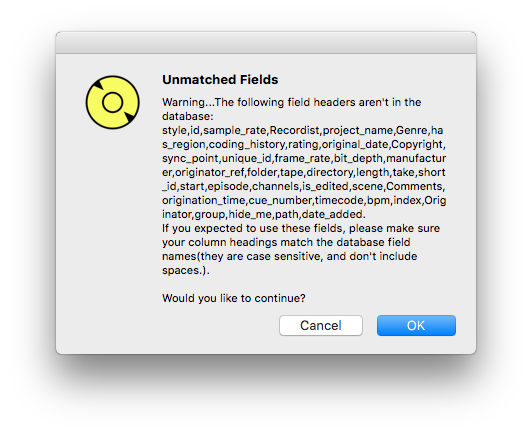 Warning: adding info to this field will burn it to the file immediately after entering. Recordist: field recordist or sound designer name. Copyright: any copyright information you’d like to add. 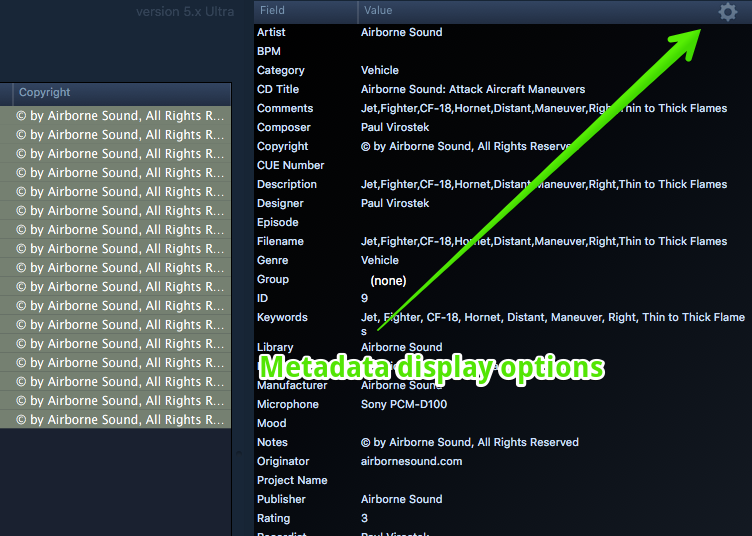 Select menu item View/Panel, Burn in Metadata or press F6. A new window will appear. Select iXML, BEXT, and ID3. Click the Burn button. This will burn the fresh information into the file itself (otherwise it will vanish if the file is removed from the app). This takes time. Sometimes a progress bar appears, but not always. If the options are greyed-out it is still working. Wait for the burn the options to activate again. You’re done! 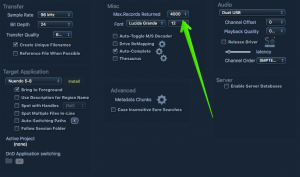 This method won’t disturb the Soundminer metadata. It adds BaseHead’s iXML metadata painlessly, allowing both to live side by side. BaseHead adds metadata to Steinberg iXML fields. Unlike Soundminer’s MetaWrapper, these fields are non-proprietary and accessible by anyone. 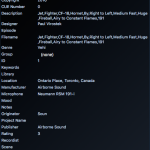 Unfortunately, Soundminer doesn’t read this information properly. Dragging BaseHead-embedded files into Soundminer reveals mismatched fields. 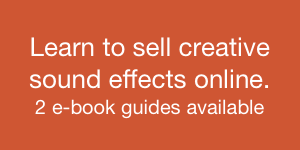 While it does adopt many fields, it misses Subcategory, Track Title, and Library. Also, it appears to dump BaseHead’s Comments in the Description field. Select menu item View/Panel, Import/Export Text File or press F7. A new window will appear. Look at the bottom half of the panel this time. Format: choose CSV. This will automatically select “Comma” from the Separator option below it. Records: choose between “Current Search Results” and “All Records in Database” as you prefer. Fields: choose “All Fields”. I’ve played with the other options but “All Fields” has the most success. Click the “Export Button”. A file selection window will appear. 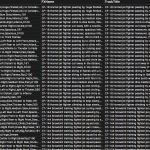 Soundminer isn’t as friendly as BaseHead when importing metadata from other apps. It’s a bit more rigid. So, we’ll need to tweak the CSV file. It’s best to do this in Excel or Google Sheets. Modify header names. BaseHead exports the iXML field names. However, Soundminer needs precise spelling and capitalization to see them. So, you’ll need to fix them all. Capitalize each word. There are a lot of columns. You don’t need them all. So, only capitalize the ones you will use in Soundminer. 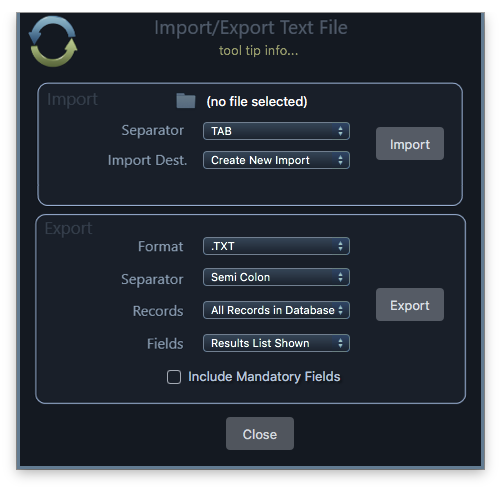 Choose menu item Database/Import text into database. A file selection window will appear. Select the CSV you saved, above. A second file selection window will appear. Navigate to the folder of sound files and select it. 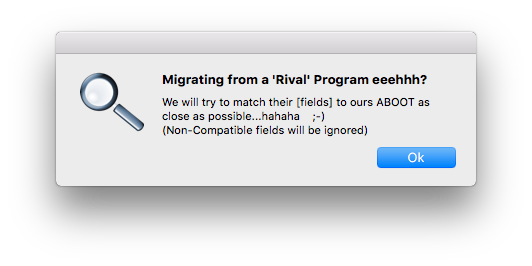 Note: you’ll receive a warning that some fields won’t match. Don’t worry about this. Many of these fields are unnecessary so it’s okay if they’re not added to Soundminer. 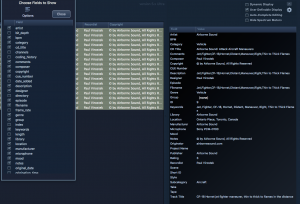 Afterwards, all the files will be added to the Soundminer database. Type command-a to select all the files. Choose menu item Database/Embed Metadata for Selected Records. We’ve learned how to go back and forth between apps. What’s the best method? Is it better to start burning metadata in BaseHead, or in Soundminer? Because Soundminer’s metadata is encrypted and the app isn’t accommodating to other metadata formats, I’d suggest using the “How to Translate Soundminer Metadata to BaseHead” method. Also, a warning: if you embed Soundminer after this process then scan with BaseHead later, BaseHead may lose track of some of the details. What happens? Well, if sounds are scanned in BaseHead after Soundminer embedding, BaseHead will adopt the Category for the Subcategory, drop the Notes field, and truncate the Genre. This doesn’t happen if you avoid embedding in Soundminer. So, it looks like Soundminer’s embedding process doesn’t persevere the BaseHead iXML metadata in the same way BaseHead respects the MetaWrapper info. It’s not consistent, so proceed with caution. The upshot? It’s best to embed in Soundminer, then BaseHead, and leave it at that. 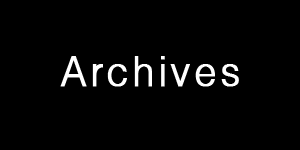 Read more about metadata in “Metadata Month” series one and series two. Only have one app? 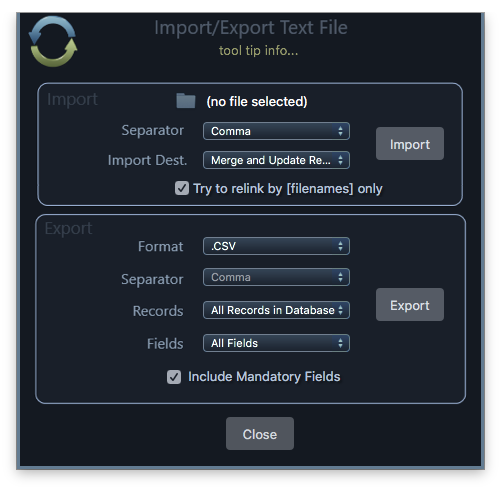 Want to import your a spreadsheet or text file into either BaseHead or Soundminer? This post explains how to create an “external” import file to add metadata to either app. Read about importing and export, burning, and writing metadata in the BaseHead manual.